Kementerian Sosial Republik Indonesia - Kementerian Sosial or referred to as "KEMSOS" is the Ministry of Social Affairs of the Republic of Indonesia. KEMSOS is one of the ministry in the Indonesian Working Cabinet (Kabinet Kerja) concerned with administration of social affairs. The Ministry of Social Affairs was formerly known as the Department of Social Affairs (Departemen Sosial or abbreviated as DEPSOS). KEMSOS has its legal domicile in Jakarta and its head office is registered at Jl Salemba Raya No 28 Jakarta 10430. The Ministry of Social Affairs was lead by the Minister of Social Affairs (Mensos). 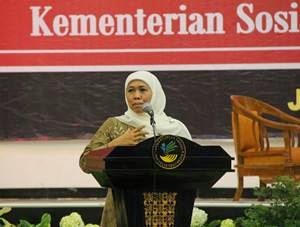 Since October 2014, Khofifah Indar Parawansa was appointed by the President Joko "Jokowi" Widodo to replace Salim Segaf Al-Jufri. According to The Ministry of Social Affairs Profile as quoted by JobsCDC.com, the organizational stucture of the Ministry of Social Affairs consist of 1 Secretariat General, 1 Inspectorate General, 1 Agency and 3 directorates. The candidates with prior experience as Pendamping Sosial PKH with educational background S1/D4 majoring in Social Welfare Studies / Social Workers is preferred. Have experience of social work practice. Located in the local district / city. Education background in Diploma or Bachelor Degree and equivalent (D3/S1/D4) majoring Social Work / Social Welfare / applied social sciences, preferably for those who have attended training and / or practical experience in the field of social assistance / facilitator of community empowerment, social rehabilitation, social protection, social security, and other poverty reduction programs. Preferably residing in the implementation location of PKT at sub-district area (according to current residence / domicile address). Located in the local sub-district area (Kecamatan). Education background in Senior High School (SMA), preferably graduated from Vocational High School (SMK) of Social Work (SMKPS), preferably for those who have attended training and / or social work experience in various social welfare services and social welfare workers district (TKSK) at least 1 (one) year. Able to communicate with the village community well and understand the community's character and local customs. Willing to be placed in sub-districts far from the district capital. The candidates with prior experience as social welfare workers district (TKSK) at least 1 (one) year and have education background in Senior High School (SMA) or equivalent is preferred. Diploma / Bachelor degree in Computer Science / Informatics / Statistics and Science and Technology disciplines, preferably for those who have attended training and / or practical experience in the field of computer / data processing and internet. Preferably residing in sub-district in the implementation location of PKH at district area (according to current residence / domicile address). Have work experience as a PKH Area Coordinator for at least 2 years. Have work experience as a PKH District / City Coordinator for at least 4 years. Having work experience as a PKH Operator for at least 5 years. Have good performance evaluation result and get recommendation from Provincial Social Service / Agency. Domiciled in locations that require Regional Coordinators. Have work experience as a PKH District / City Coordinator for at least 2 years. Have work experience as a PKH Social Assistant for at least 5 years. Have good performance evaluation result and get recommendation from Provincial Social Service / Agency and Area Coordinator. Domiciled in locations that require Area Coordinators. Perform well based on performance appraisal of District/City Social Agency and has never received a warning letter (SP) in the last 4 (four) months. Gget recommendation from District/City Social Service / Agency. Domiciled in locations that require District/City Coordinators. JobsCDC.com now available on android device. Download now on Google Play here. Please be aware of recruitment fraud. The entire stage of this selection process is free of charge. Kementerian Sosial RI - Recruitment Program Keluarga Harapan PKH Kemsos October 2017 will never ask for fees or upfront payments for any purposes during the recruitment process such as transportation and accommodation.